We knew another LTE-enabled Chromebook was in the works and I even had a pretty good idea who was making it but now, the CTL Chromebook NL7 w/-LTE is official and will be launched on the Sprint network. Aimed at the Business and Education market, the Chromebook NL7 LTE is simply a variant of CTL’s current model with the addition of mobile data capabilities. I can confirm that the codename for the new LTE-enabled Chromebook is ‘Blacktip-LTE’ mentioned in the above article link. 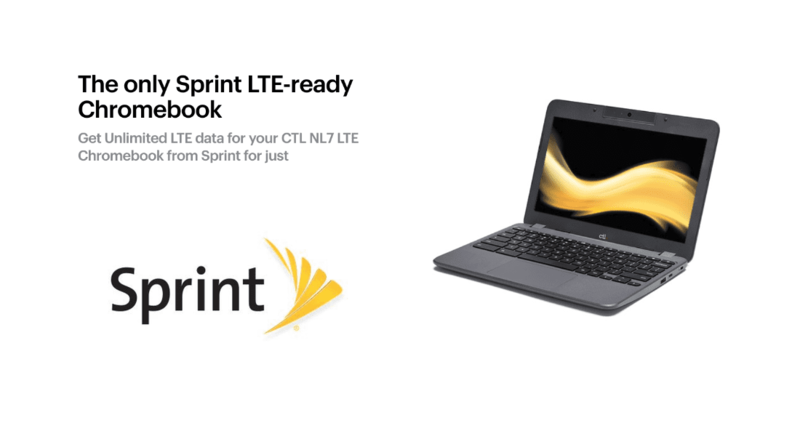 The second device to launch with built-in LTE this year, the CTL NL7 follows last months release of Samsung’s Chromebook Plus LTE model powered by Verizon’s network. The Samsung is a great device with superior hardware but the CTL NL7 Chromebook offers some distinct advantages. First will most certainly be the price. No official MSRP has been announced but the non-LTE NL7 is a frugal $240. I don’t suspect the new version, with the same specs, will drive a much higher premium just for the addition of LTE. $279 sounds like a good price point for this Chromebook and even if it’s $299, it is still very competitive. A close second will be the CTL’s rugged design. The Samsung Plus is a well-designed Chromebook but it wasn’t created with the daily rigors of work or play in mind. For the on-the-go employee or the active kiddo, the CTL will stand up to abuse much better than the Samsung. On the inside, the CTL gives you an Intel N3350 processor, 4GB RAM and 32GB of storage. Android apps are available out of the box and Linux apps should be on board if not coming very soon. Third (and this is both objective and subjective) is the carrier. Sprint may not appeal to many users but the fact of the matter is, geography has a lot to do with carrier choice. Most of us around the Chrome Unboxed office are huge fans of T-Mobile thanks to their great coverage, awesome unlimited plans etc, etc. Sprint is also very popular in this area. Verizon, for all their accolades, is garbage here. It’s not their fault. They just don’t have coverage here due to an agreement with a local cellular provider. There isn’t a Verizon store here and you can’t even get a Verizon plan with a local number. Again, it boils down personal preference and usability. 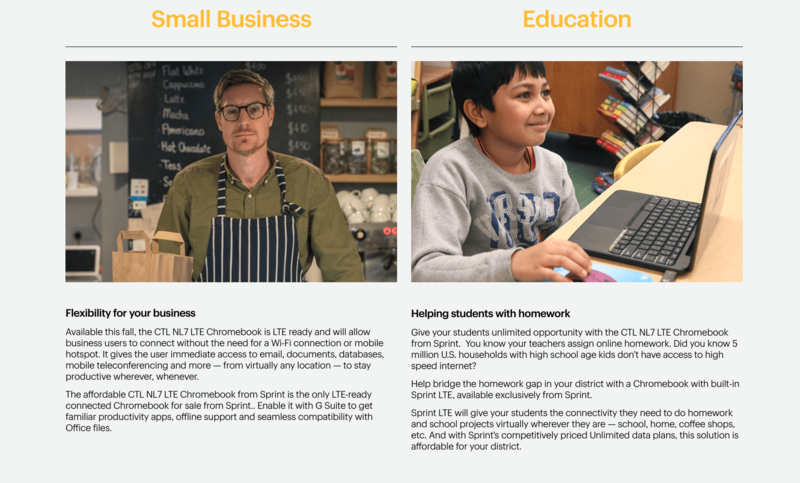 For the money, the discounted Sprint unlimited data plan comes in at a mere $15/month. For more details, you can contact the Sprint business department at the link below. Availability is list as “this fall” but I expect to see the CTL available by the end of the month. I should have more details on the CTL/Sprint collaboration tomorrow and will get those out ASAP when they arrive.